Connecting the Dots with Monsta X’s "The Connect: Dejavu"
Over the years, we’ve witnessed a greater interest and positive response towards the act of incorporating storyline concepts amongst K-pop groups and their artistic releases, and Monsta X isn’t a stranger to creative serial K-pop releases. They’ve strategically linked their previous releases with elaborate storylines, this time focusing on the theme of connection with The Connect: Dejavu. Their new album also marks the end of the coming-of-age story that unfolded in their previous album The Code, where they focused on the theme of time. According to Korea Herald, the seven-piece boyband said that they’re bonded by a spiritual connection and after hopping about different years as time travelers, they’re now reunited as a full group for this album. Keen to be part of the creative production, Jooheon and I.M also wrote the lyrics for all tracks in the album, while Wonho composed and wrote “If Only”. The seven-track album is fronted by title track “Jealousy”, a brew of retro-punk R&B groove, future pop and trap. Before listening to it, I was a tad skeptical – last year’s hella funky “Dramarama” completely exceeded my expectations, declaring a stellar upgrade in Monsta X’s sound, so I wasn’t sure if “Jealousy” would pale in comparison or actually surpass it. But voilà – the smooth R&B-tinged dance track significantly deviates from Monsta X’s initial hip-hop influences and is a testament to their flair for the theatrical and dramatic without being too twee, erasing my initial doubts. The insanely catchy background vocals are killer here. The ‘ye-ye-ye‘ hook by main vocalist Kihyun is most likely the slickest part of the song, reining listeners in almost instantly, with a hue of elusiveness and seduction alongside the atmospheric, expansive instrumental. The buoyant delivery of the vocals adds great texture and is one of the quaintest touches Monsta X has added to their music. While “Jealousy” isn’t as compelling as “Dramarama”, it still remains within their newly secured domain and the repetition of “jealousy” throughout the piece has its own charm that will leave you riveted. I also had a good laugh during Wonho’s part before the second chorus where he sings “Why are you looking at Shownu? You’re making me jealous”. The second track “Destroyer” starts off slow and develops into a dramatic and hip-hop-tinged banger. Here, we get to enjoy dynamic rapping by I.M and Jooheon who simultaneously bounce off each other. Kihyun’s belting on the words “destroyer” and “rewind” in the chorus is also a standout here, driving a majority of the song. “Destroyer” also has strong potential in being the title track and many fans have expressed that they preferred it to “Jealousy”. During their press conference, the members mentioned that each track was worth being chosen as a lead song, but the production team probably saw “Jealousy” as a more public-friendly track and also more fitting for a dance performance. Lyrically, it’s dense with symbolism – it talks about ambitiously yearning to conquer fate and time to reconnect with a loved one, tying both concepts of time and connection together. Jooheon’s single liner before the last chorus got me feeling a little something – so it’s no surprise why I’d laud “Destroyer” as the most promising song from the album. “Fallin’” rests heavily on the EDM-influenced pop and mainstream deephouse trend with its noisy synths, playful rapping, auto-tuned pitch-lowered vocals and electronic instrumental chorus. It’s a fun song and catchy enough for you to want to nod along with the rhythm, but the arrangement here is disorganised and the transitions between the verses and chorus (or lack thereof) sound shoehorned in and painfully discordant. After the first few hard-hitting tracks, the album progressively shifts in energy with “Crazy in Love” and Wonho’s self-composed piece “If Only”. 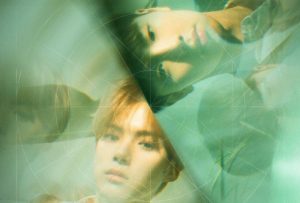 There’s a fine line between a refreshing b-side and a cloyingly generic K-pop boyband b-side, and this is where The Connect: Dejavu falls short. Both tracks don’t bring much conceptual importance and it feels like they were slotted in to be filler tracks. “Crazy” is your typical saccharine-induced love track: a love story about a guy who laments about how he’s crazy in love, crazy over a girl – yes, we get it. There’s indeed a romantic connection, but it’s also just like every other love song, so nothing new there. For what they’re worth, both tracks join Monsta X’s history of soft pop B-sides that many fans adore, so to each his own. Things start to get intriguing again with “Lost in the Dream” and “Special”. As the title suggests, “Lost in the Dream” is atmospherically dreamy with elevated waves of passion. Lyrically strong, it falls just slightly behind “Destroyer” in being the standout from this album. Together with their dulcet vocal tones, the lyrics and instrumental track adroitly paint an aural cosmic landscape. Strategically placed as the last track, Jooheon’s “Special” is an aggressively culminating piece that adorns a trap and brass sound, a familiar style found in their previous releases like “Trespass” and “Rush”. On Song Eun Yi & Kim Sook’s Unnies Radio, Jooheon mentioned that he has been working on the piece since his trainee days – so it’s no wonder it brings to mind their earlier works. It’s evident that the boys understand their strengths and aren’t afraid to foray into foreign fields to reinvent themselves as artists and enhance their signature style. However, the production of The Connect: Dejavu is not quite on par with their previous album The Code. This album has such a promising premise and contains the group’s upgraded style with the addition of new musical influences, but I would have liked it more if their titular concept had followed throughout the whole album. It’s also supposedly the closure of their coming-of-age story from The Code, but the mediocre conclusion does no justice to a series that’s packed with potential. We are hardwired to find a connection with people and the things around us through conversations, stories, art and music, so hopefully, 2018 would be the year where Monsta X develops exponentially in terms of their artistry and personal connection with their music and hits their stride.